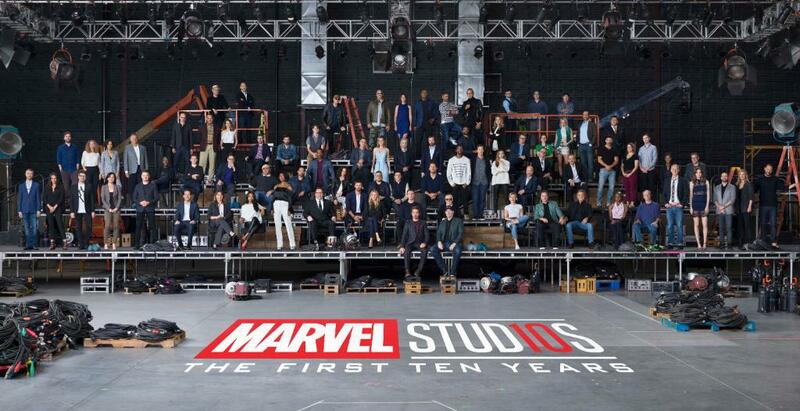 INDEPENDENT – While the annual Oscars ‘class photo’ may have stolen headlines earlier this week, Marvel Studios has decided to release their own star-studded photo, featuring 80 actors and filmmakers from their multiple movies. Meeting for the secret shoot on the 7 October last year during the filming of Avengers: Infinity War to celebrate 10 years since Iron Man, the photo features Robert Downey Jr. and studio head Kevin Feige front-and-centre. Other notable names include the three Chrises (Chris Evans, Chris Hemsworth, Chris Pratt), and Avengers actors Samuel L. Jackson, Scarlett Johansson, Mark Ruffalo, Anthony Mackie, Elizabeth Olsen, Paul Bettany, Paul Rudd, Tom Holland, Don Cheadle, Sebastian Stan, and Jeremy Renner. Future Avengers members Benedict Cumberbatch, Chadwick Boseman, and Brie Larson also appear, as do the Guardians of the Galaxy actors Sean Gunn, Zoe Saldana, Karen Gillan, Dave Bautista, Pom Klementieff, Michael Rooker, Vin Diesel, and Kurt Russell. INVERSE – Captain America: Civil War was released September 2nd as an iTunes digital download. The package includes the blooper reel previously launched online, and a bunch of mini comics and behind the scenes featurettes, some of which are unlockable based on the viewer’s self-professed “team”. 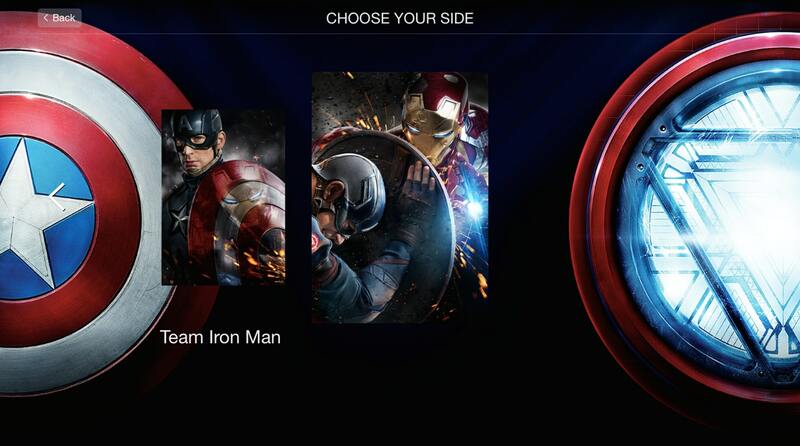 Opening up the digital download launches a menu screen which asks viewers to choose a side: either Team Cap or Team Tony. E! ONLINE – Black Widow and The Hulk aren’t the only heroes who found love in a hopeless place. Although many of the Avengers grow apart in Captain America: Civil War, two of them manage to grow closer: Vision (Paul Bettany) and Scarlet Witch (Elizabeth Olsen). E! News has an exclusive first look at a bonus feature from the Marvel movie (available on Digital HD Sept. 2 and Blu-ray Sept. 13), in which the stars explain how their characters’ relationship was almost predestined. COLLIDER – With the home entertainment release of Captain America: Civil War on the horizon, the special features are steadily finding their way online. We’ve seen some deleted scenes, and today we have a glimpse at the gag reel for the film. While there’s nothing major in this minute of bloopers, it still shows the cast having a good time as they flub their lines or mug for the camera between takes. We also see the difficulties in Falcon making a landing and Robert Downey Jr. pretending to get upset with Tom Holland. These are the light moments that gag reels promise, and it looks like the one for Civil War will deliver. Check out the Captain America: Civil War gag reel below. Captain America: Civil War hits Digital HD, Digital 3D and Disney Movies Anywhere on September 2nd and Blu-ray 3D, Blu-ray, DVD and On-Demand on September 13th.